Hamad I Mohammed/Reuters; Middle East Monitor via Reuters; Matt Dunham – WPA Pool/Getty ImagesSaudi Arabia, including Crown Prince Mohammed bin Salman, has consistently denied having any knowledge of the Saudi critic Jamal Khashoggi’s whereabouts. 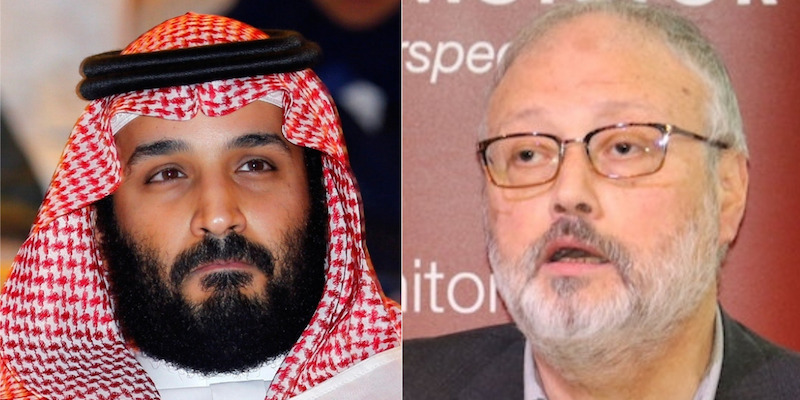 Earlier this week, Turkish media identified 15 men as suspects in the disappearance of the Saudi critic and journalist Jamal Khashoggi after he visited his country’s consulate in Istanbul last week. The Saudi-owned Al Arabiya TV channel aired a segment on Thursday claiming that the 15 men were tourists. The report seems to be taking a page out of Russia’s playbook in the Sergei Skripal case: After Britain accused two Russian agents of poisoning Skripal in England earlier this year, the two men appeared on Russian TV to claim they were tourists going to visit the country’s famous cathedral. Saudi Arabia appears to have taken a page out of Russian President Vladimir Putin’s playbook with a baffling response to the disappearance of Jamal Khashoggi, a Saudi critic and journalist who went missing after visiting the Saudi consulate in Istanbul last week. The investigation into Khashoggi’s whereabouts and well-being has been highly confusing, with US and Turkish intelligence leaks, the Turkish government’s changing official line, and little more than expressions of concern from other world leaders. Earlier this week, Sabah, a Turkish pro-government newspaper, published photos of 15 people it identified as part of a Saudi intelligence team involved in Khashoggi’s disappearance. They arrived at Istanbul’s Ataturk Airport on October 2, the day Khashoggi disappeared, and left the country later that night, Sabah reported, citing photos it said were taken at passport control. The team travelled on two corporate jets rented from a company often used by the Saudi government, The Guardian reported, citing unnamed Turkish authorities. Al Arabiya claimed that the “misused pictures” were of tourists flying on commercial airlines at Ataturk. “Unlike what reports said about them arriving in a private jet, the tourists are shown to be in a terminal gate waiting area in an airport crowded with travellers,” the network said. WATCH: Who are the 15 #Saudi tourists falsely accused of killing #Khashoggi? This form of denial from the Saudi network appears to be taken from Russia’s playbook. Saudi officials, including Crown Prince Mohammed bin Salman, have repeatedly denied knowledge of Khashoggi’s whereabouts, insisting that Khashoggi, 59, left the consulate shortly after he went in. Khashoggi’s fiancée has said she waited outside the premises for 11 hours and never saw him. “During the Khashoggi affair, before it, and probably long after it, different GCC media are going to be promoting what they think people in power in their states want them to say. “Whether it’s true or false seems to be far less important than how their ‘loyalty’ is perceived – that’s true across the board, alas, on all sides in the GCC.